Arrival in Ho Chi Minh. We welcome you at Airport and transfer you to hotel. Overnight in Ho Chi Minh. We start the trip by these famous places: Notre Dame Cathedral, the historic Central Post Office, followed by exploring the Reunification Palace, and the remarkable site of the War Remnants Museum. (Drop you off at Ben Thanh Market for shopping if we have enough time). Afternoon, Arrival at Cu Chi tunnel, before entering the tunnels visitors can watch a short introductory video showing how the tunnels were constructed. You will spend the next hour exploring the tunnels. Afterwards, enjoy tea, cassava (guerrilla’s food during the war). Around 8.00am, head to Can Tho, enjoy the scenic journey along the National Highway bordered by green rice fields. On arrival at My Tho, visit Vinh Trang pagoda, take a leisurely boat ride along the river, view stilt houses, fruit plantations and fishing villages along the river bank. Proceed to Tortoise islet, have lunch in the orchard garden. Then a boat ride to An Khanh, a less touristy attraction in Ben Tre, enjoy cruising on a hand-rowed sampan under the shade of the water coconut trees along natural canals. Then enjoy seasonal fruit & honey tea to the sound of “Southern Vietnamese folk music”, performed by the locals. Visit a family business which epitomizes the idyllic rural lifestyle, taste delicious coconut candy & observe the pastoral life as you roam through fruit plantations and villages. Transfer to Can Tho city. Stay overnight at hotel in Can Tho. 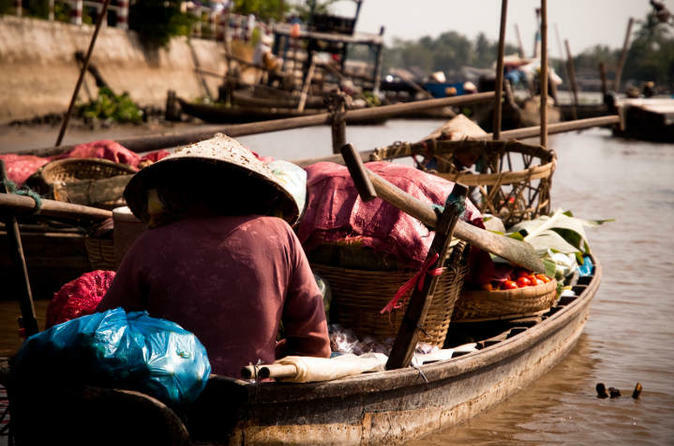 Take a leisurely boat trip to explore the picturesque tributaries of the Lower Mekong river, then proceed to visit Cai Rang floating market which are the liveliest in the whole religion. Have you ever tasted Vietnamese vermicelli soup? Well, now go and see how it is made. Then wander around the village and meet the friendly local people and experience how to cross a “Monkey bridge” which is built by only o¬ne stem of bamboo. We continue the tour and stop at a orchard garden. Stop for lunch. Then go back to Ho Chi Minh city. Overnight at hotel in Ho Chi Minh. Morning, breakfast at hotel. In this morning, you will go shopping and sightseeing at the 2 large and famous markets in Ho Chi Minh: Binh Tay market & Ben Thanh market. After lunch, we transfer you to Tan Son Nhat airport in Ho Chi Minh city for your departure flight. Arrival in Hong Kong, we welcome you at Airport and transfer to Regal Oriental Hotel. Day 6 Hong Kong Half Day sightseeing tour. Mentioned Meals (B,L,D = Breakfast, Lunch, Dinner). Transfer & transport as per itinerary.